Hospitals have long relied on the heroics of one brilliant nurse or doctor to save the day. Such heroics often result in temporary workarounds and quick fixes that leave not only patients and quality care at risk, but also increase costs. This is the story of an organization breaking that habit. Like a growing number of healthcare organizations around the world, ThedaCare, Inc. has been using lean thinking and the principles of the Toyota Production System to improve quality of care, reduce waste, and become more reliable. But lean thinking was incompatible with ThedaCare’s old top-down, hero-based system of management. Written by Kim Barnas, former SVP of ThedaCare. Kim shows us how she and her team created a management system that is stable and lean, to spur continuous improvement. 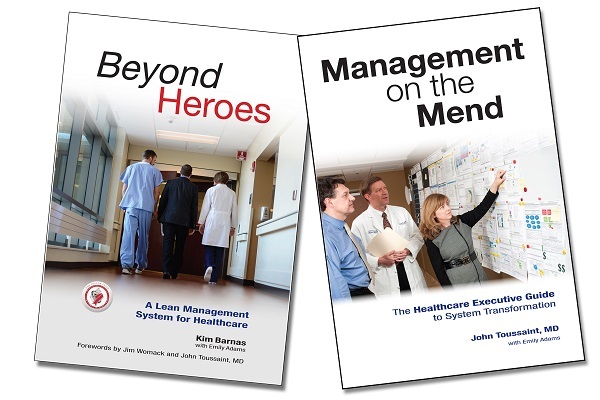 Beyond Heroes shows the reader, step by step, how ThedaCare teams developed the system, using the stories of its doctors, nurses and administrators to illustrate lean principles. The book explores each of the eight essential components of the lean system, from front-line problem solving with the scientific method to daily team huddles and creating standard work for leaders all the way to the top of an organization. Finally, the author introduces four executives from healthcare systems across North America who have implemented ThedaCare’s system and share the lessons they learned along the way. Five years after his debut book, On the Mend, Dr. John Toussaint returns with news for healthcare leaders. There is a clear framework for success for transformation. And senior leaders need to be far more intimately involved. While studying and assisting hundreds of organizations transitioning to lean healthcare, Dr. Toussaint witnessed many flaws and triumphs. Those organizations that win – creating better value for patients while removing waste in the system – have senior managers that lead by example at the frontline of care model. The best health systems have also discovered ways to engage everyone in solving problems and embracing change. Management on the Mend is the result of years of investigations by Dr. Toussaint of dozens of healthcare organizations around the world. As senior leaders look ahead to a future that includes radical changes that include population health management, the healthcare payment system, and patient expectations, everyone knows that health systems must be agile to survive. In order to thrive, they must be able to continuously improve. Here is the roadmap for that future. Many people talk about lean management, but Kim Barnas is one of the few who has actually built a robust lean management system in healthcare. Beyond Heroes will be immeasurably useful to organizations that are looking to move beyond tools and projects to a culture that creates the best patient care and a far better workplace for healthcare professionals. This book is full of impactful stories and meaningful, practical advice that is grounded in the realities of healthcare while making real the potential that every organization should be achieving. I’d strongly recommend this book to every healthcare leader – read it, talk about it, and put in the hard work required to make these meaningful changes happen.